The electron microscope (EM) is among the most valuable tools used in the study of biology and has revolutionized the discovery and characterization of the subcellular structure of the cell. Viewing these structures was not possible with the standard light microscope (LM) that had been developed at the end of the sixteenth century. IT’S A VERY SMALL WORLD. The LM magnifies objects up to 2,000 times, while the EM visualizes objects up to 2,000,000 times and at much higher resolution. The two basic EMs are the transmission electron microscope (TEM) and the scanning electron microscope (SEM). The TEM transmits electrons through thin tissue slices, and its two-dimensional images are used to examine the internal structure of cells. In the SEM, the electron beam sweeps across the sample and is used to study the surface detail of solid living specimens. It produces excellent three-dimensional images but is only one-tenth as powerful as the TEM and provides lower resolution. The extraordinary magnification of EMs comes at a number of costs: EMs are very expensive to purchase and maintain; researchers need considerable training in their use and the preparation of biological specimens; TEM specimens must be stained and visualized in a vacuum that precludes the study of living samples; and EMs are large, and must be housed in vibration-free rooms. The EM was developed at the University of Berlin by physicist Ernst Ruska and his professor, Max Knoll. Knoll knew that optical resolution (the ability to distinguish between two points, a measure of detail) was dependent upon the wavelength of the source of illumination, and that the wavelength of electrons is 1/100,000 that of light particles. Based on this relationship, using a beam of electrons that was focused on the specimen with electromagnets, they developed the first EM in 1931. It was improved and commercialized in 1939, and Ruska was the recipient of the 1986 Nobel Prize in Physics. In the 1950s, George Palade at the Rockefeller Institute (now Rockefeller University) used the EM to make discoveries on the fundamental organization of cells, for which he was a co-recipient of the 1974 Nobel Prize in Medicine. SEE ALSO: Leeuwenhoek’s Microscopic World (1674). A scanning electron microscope can produce magnification up to 500,000 times. 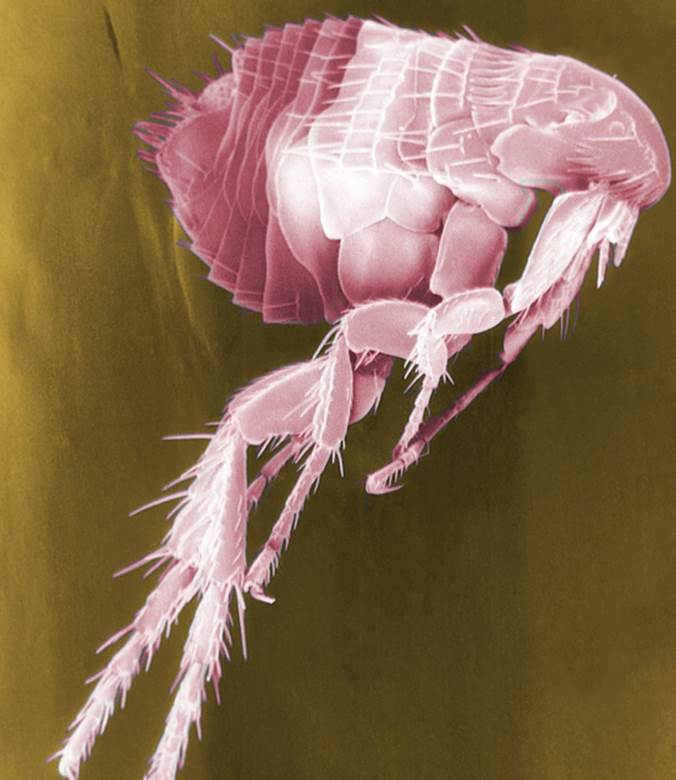 This SEM image of a flea—which is known to carry a number of diseases transmitted through its bites, including the bubonic plague, caused by the bacterium Yersinia pestis—has been artificially colorized.